Our Hand Molded KYDEX Inside the Waistband Gun Holster is the perfect every day carry option for your weapon. The rigid .08 KYDEX is heat-formed to your specific model gun for an exact, custom fit that will last a lifetime. Each holster has an integrated sweatguard, adjustable cant or carry angle from 0-15 degree, and adjustable retention. Our unique adjustable cant feature allows you to carry vertically (0 degrees) to FBI (15 degrees) or any angle in between. 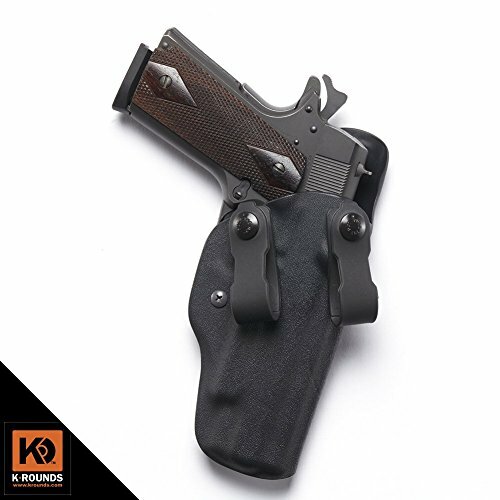 This allows you to carry in just about any position along your waist including Inside the Waistband (IWB), Appendix Carry (AIWB) and Back Carry. Choose from over 40 different gun models and over 85 color options for that unique look that works just for you. All gun models and color combinations are always in-stock.